The application of diverse manual techniques of touch and stroking to muscles and soft tissue to achieve relaxation and to improve the client’s well-being. In other words, the primary function of massage is to promote relaxation. Bodywork on the other hand is defined in two ways by the same source. It is a collection of techniques for restoring health and balance to the entire person by working through the body. Bodywork is the application of one or more systematized methods of manipulating the body to promote health. Swedish massage therapy involves mild, moderate or deeper strokes on the back, arms, legs, neck and other body parts to target tissues and muscles for maximal pain relief, stress release and relaxation. Swedish massage helps promote healing while targeting pain, injuries, stress and stiffness using gliding, kneading, tapping, friction and light shaking—designed to ease back pain and help relaxation. Sports massage is geared toward participants in athletics. It is used to help prevent injuries, to prepare the body for athletic activity and maintain it in optimal condition, and to help athletes recover from workouts and injuries. It promotes flexibility and help prevent injuries. It aides healing after sports injury. Deep tissue massage is a technique that focuses primarily on the deeper layers of muscles and the fascia. Sometimes this technique involves the therapist using firmer pressure in order to reach these key areas and get them to release, which is why this particular massage is oftentimes recommended for people who are comfortable with a slightly more intense touch. However, deep tissue massage can also refer to gentle yet sustained pressure targeting the myofascial layer. Hot Stone Massage involves the application of heated stones (thermotherapy) to the body within the context of a therapeutic massage. 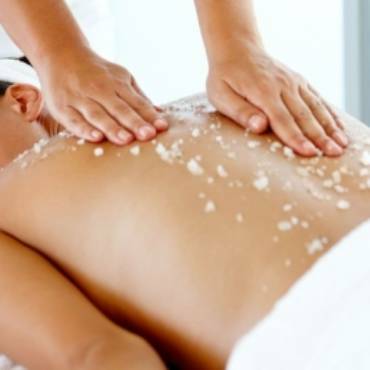 Round, smooth stones are heated to luxurious warmth, oiled and used in the palm of the hands to massage the body. Heat penetrates deeply, prompting profound relaxation, increased detoxification, and relief of long-standing muscular tension, stress and fatigue. Reiki is a natural healing method which balances the vital life energy present in all living things. Energy work therapies help to clear, balance, and strengthen the energy anatomy; the pathways through which energy travels, within and around the human body, including meridians, chakras and the energy field, or aura. Movement of energy through these pathways maintains the health of the surrounding physical body. This is the most commonly used technique for a Quick Massage. It is particularly suitable for fast calls in urban areas where time is the essential. A 15 minutes is sufficient for customers to recover from the stress of day to day fast paced workday routines. Exfoliates your entire body to leave you with smooth skin and increased blood circulation, promoting the removal of toxins followed by intense hydration and aromatherapy. Stimulates nerve pathways, opens up circulatory and lymphatic pathways. Promotes detoxification, releases endorphins to reduce pain. Enhances muscle relaxation. ​Brings about deep relaxation. Pregnancy is a very powerful and transformative time in a woman’s life and massage therapy is a wonderful way to help assimilate all the exciting changes. Prenatal/Postnatal helps relieve common pregnancy discomforts such as swollen feet, and lower back tension. It can reduce anxiety, decrease symptoms of depression, relieve muscle aches and joint pains. Oriental technique and other holistic modalities to enhance all function of detoxification. As a result, it helps heal and re-balance the whole body. Facilitates deep relaxation, help heal many stress-related conditions. Good for hormonal imbalances and sleep disorders. Also, congestive symptoms and digestive disorders. Myofascial Release is a safe and very effective hands-on technique that involves applying gentle sustained pressure into the myofascial connective tissue restrictions to eliminate pain and restore motion. Myofascial release techniques relax and lengthen muscles and soft tissues. Craniosacral therapy is a gentle, non-invasive, hands-on healing modality that balances the craniosacral system in the body, which includes the bones, nerves, fluids, and connective tissues of the cranium and spinal area. Trigger Point Therapy involves placing pressure on that trigger point so that the muscle can relax and the pain can be lessened. Pressure is generally applied with fingers, knuckles, and elbows. This form of therapy is often followed by stretching the muscles. Aromatherapy massage combines the natural therapeutic properties of the essential oils and the healing power of massage therapy. Aromatherapy massage not only has powerful physical, emotional and mental effects but it is also described as a great relaxing and rejuvenating experience. Aromatherapy massage is a pleasant method for mental clarity, relaxation, stress and headaches alleviation. Lymphatic drainage is a therapeutic massage treatment. The massage uses very light pressure and long, gentle, rhythmic strokes to increase the flow of lymph and reduce toxins in your body. Lymphatic drainage massage can have a beneficial effect on your general health. Because lymph is key to keeping your immune system working properly, improving the flow and drainage of lymph around the body is good for you in lots of ways. A Medical Treatment Massage is a combination of massage modalities and massage enhancements to treat a specific area of the body or a condition. It uses the application of a specific treatment targeted to a specific issue/problem the client presents after an assessment/evaluation with the Licensed Massage Therapist. The Medical Treatment Massage takes whatever style of massage the therapist knows and applying that technique to specific condition. Thai massage can release muscular tension, increase flexibility and mobility of joints and improve breathing. The techniques used can also help to increase blood circulation, boost the immune system and promote mental clarity. Thai Massage is performed on a mat on the floor using no oils, as it is done on top of clothes. The client must wear loose or stretchy clothing like yoga gear. Massage Cupping is the combination of massage movements and the use of a suction device on the skin. A cup is positioned at the area to be treated and a vacuum is created within the cup to draw the skin and underlying tissue into the cup. The suction created by this seal brings blood to the surface of the skin and is thought to help expel negative energies from the body. Although cupping is not painful, the recipient commonly walks away with circular bruises on the areas where the cups were applied. It’s said that couples who experience things together tend to have a stronger connection. Having a couples massage increases feelings of affection and intimacy. We offer a discount on our most popular massages. Create your own perfect celebration for birthdays, bridal showers and bachelorette parties, best clients or most valued employees. Celebrate a birthday, treat your employees to a wellness day or just get together with a few good friends. 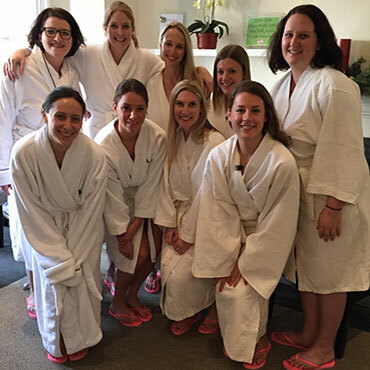 Nothing will make your guests feel special and pampered as a party Massage at Deluca Massage & Bodywork!